I’ve been writing on Israel since college. But in the mid-1990s, I decided to begin a systemic study of the history and political theory underlying the Zionist movement. This was in response to what seemed to me to be a dramatic weakening of Israel’s commitment to its constitutional status as a “Jewish state”–that is, to its character as the national state of the Jewish people. 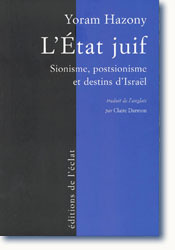 Since then, I’ve contributed a number of books and essays to the effort to try and clarify what it means for Israel to be a Jewish state, to trying to understand what happened to this idea, and to proposing ways in which commitment to this idea can be strengthened in Israel and abroad. The most important of these was my book The Jewish State: The Struggle for Israel’s Soul, which played a central role in sparking a revival of Zionist thought and after its publication in 2000. As a result, a number of historians have credited me with formulating “neo-Zionism” as a response to post-Zionism in Israel. (See, for example, Ilan Pappe, The Idea of Israel: A History of Power and Knowledge [Verso, 2014], pp. 248-250; Elisabeth Roudinesco, Revisiting the Jewish Question [Polity, 2014], pp. 183-184; Benny Morris, Making Israel [University of Michigan, 2007], pp. 222, 226). 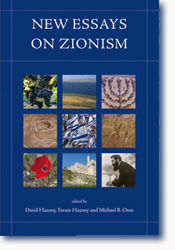 David Hazony, Yoram Hazony and Michael Oren, eds., New Essays on Zionism (Jerusalem: Shalem Press, 2006). 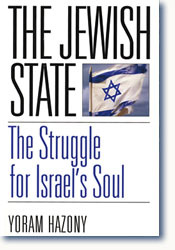 The Jewish State: The Struggle for Israel’s Soul (New York: Basic Books and The New Republic, 2000). “The Current Crisis in Israel’s Constitution,” in Simon Rabinovitch, ed., Defining Israel: The Jewish State, Democracy and the Law (Cincinnati: Hebrew Union College Press, 2018), pp. 145-157.